This interesting name, of Anglo-Saxon origin, is found chiefly in Yorkshire, Lancashire and the Midlands, and is a variant of the occupational name Webb, which was originally given to a weaver. The derivation is from the Olde English pre 7th Century "wevva", developed into the Middle English "webbe", a derivative of "wefan", to weave. Job-descriptive surnames originally denoted the actual occupation of the namebearer, and later became hereditary. The name was introduced into America as early as 1631, when John Webster emigrated from England to Massachusetts, and later became Governor of Connecticut in 1656. 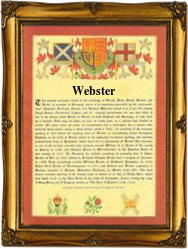 Noah Webster (1758 - 1843), the lexicographer, was a descendant of this founder of city and state. Also Daniel Webster (1782 - 1852), the American politician and orator, was born in New Hampshire and was a descendant of Thomas Webster, whose family had settled in Massachusetts in 1635. The Coat of Arms most associated with the name is a blue shield with five silver swans close in cross between four gold annulets, the Crest being a silver swan's neck erased beaked red, in the beak a gold annulet. The first recorded spelling of the family name is shown to be that of John le Webestere, which was dated 1275, in the "Hundred Rolls of Norfolk", during the reign of King Edward 1, known as "The Hammer of the Scots", 1272 - 1307. Surnames became necessary when governments introduced personal taxation. In England this was known as Poll Tax. Throughout the centuries, surnames in every country have continued to "develop" often leading to astonishing variants of the original spelling.